Welcome to 2015 everyone, hope you all managed a restful and enjoyable festive period. I've managed to start the year the way I mean to go on, slipping in a 3 hour painting session last night and managing to just about complete these 4 miniatures. They're painted to match the rest of my pulp Kali Cult and bring some much needed ranged weaponry to the cult. 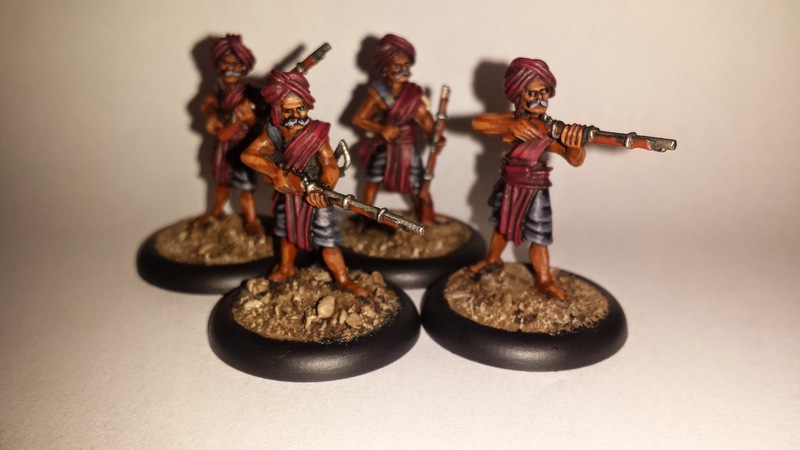 Figures are Bundalee Native infantry from Mutineers 28th Indian Mutiny range. I noticed when packing themy away that I've not highlighted the red quite as much as the rest of the miniatures I've done to so I may pull them out 90 the cabinet tonight and add another highlight just to keep them consistent. Well that's it for this week, see you next Wednesday. Happy painting. Yeah, you know you missed 2914 and it's 2015 right? Good to see Wednesday painting is working out. Now, I like the look of them - I can feel a purchase coming on!